Red Bull Extreme Sailing Austrian duo Roman Hagara and Hans Peter Steinacher finished 10th, whilst their British crew man Will Howden came 6th with helmsman Leigh McMillan, who is in Qingdao coaching Oman Air. Argentinian Santiago Lange, who is skippering Artemis Racing in place of Terry Hutchinson for Act 2, reached the Olympic podium to secure Bronze and New Zealander Glenn Ashby, racing with Emirates Team New Zealand, went one better and returned home with Silver. 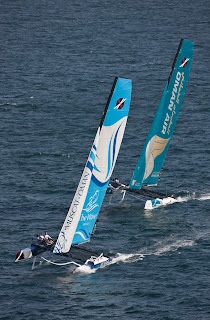 Collision between The Wave, Muscat and Alinghi. The teams are in the final stages of preparation, fine tuning their boats, discussing tactics and studying their weather files. Racing starts tomorrow (Wednesday, 13th April) for two days of non-public racing, allowing the race management team to set optimum race courses further offshore if required, before Act 2 opens to the public from Friday, 15th through to the final day on Sunday, 17th April when one of the 11 teams will lift the Double Star Cup. 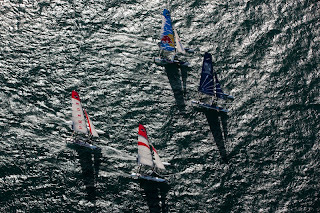 For the Extreme 40 sailors they will adapt to whatever the weather situation and are used to racing at the Extreme Sailing Series venues that do not follow the conventions of other sailing events, racing directly in front of the public in city centres, on canals, off beaches or on rivers. The teams adapt quickly to their local environment and as we saw at Act 1 at The Wave, Muscat, the teams slower off the starting blocks were soon back in the mix, which was the case for Luna Rossa as Paul Campbell-James explained: “We were pretty happy after Act 1, results-wise we were hoping to get on the podium, but the way it went we were just off fourth place and we started pretty average and finished pretty well. 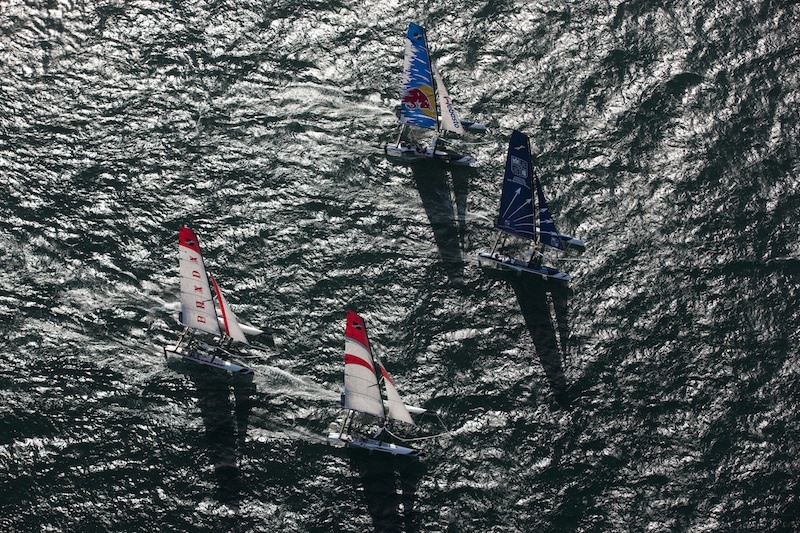 The people of the ‘City of Sails’ are going to witness five days of intense competition… Let the battle commence! View the current overall standings here.